It has long been known that a near-death experience can sometimes trigger psychic abilities and other right-brain functioning in humans. A recent incident at an Israeli zoo indicates that advanced brain functioning also can occur in other lower primates as well. An Associated Press story told of Natasha, a five-year-old black macaque in a zoo near Tel Aviv, that started walking “exclusively on her hind legs” after recovering from a stomach virus that nearly killed her. 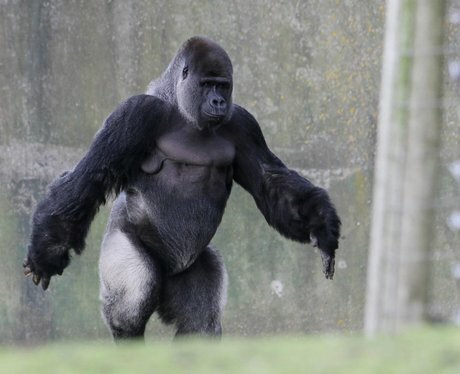 The report released a photograph that appeared in the Maariv daily that shows the primate standing in an upright position. Zoo keepers said Natasha began her strange behavior after she and three other monkeys suffered from a severe form of stomach flu, the story said. They said this monkey suffered from severe respiratory problems, her heart started beating irregularly, and veterinarians at the zoo clinic thought for a while she would die. They note that Natasha now seems to be “aping” the way humans walk after observing them. Apes and monkeys normally walk bent over, using their upper arms like legs although they are capable of standing on their hind legs while using their hands. Some apes have been tested for intelligence, and been taught to communicate with humans through sign language. They generally achieve the mental level of a small child. This may be the first time a primate has been observed trying to mimic the way a human walks and stands. It suggests that the near-death experience, which would be rare among apes, triggered something in the animal’s brain that sets it apart from the others. It would be interesting to test this animal for its intelligence level, and see what other things it can learn during its lifetime.